Companies today largely utilize job assessment tests to accurately gauge skill levels and verify experience of candidates in their external hiring processes. According to Harvard Business Review, approximately 76% of large organizations (those with more than 100 employees) utilize assessment testing in their external hiring processes. The cited study (by CEB/Gartner) also notes that assessment tests aren’t just for junior roles—nearly 80% of senior-level positions require some sort of assessment test for candidates. Compare this to those for entry-level (59%) and mid-level roles (72%). Skills Assessment Test – employers use skills tests to determine the candidate’s clerical skills (data entry, typing), technical/programming skills, and competencies with software (e.g., MS Office applications, popular accounting packages, etc.). Simulation –use everyday workplace scenarios to identify the decision-making style of a candidate. Simulation assessments are common in positions like customer service and technical support that have high touch rates with external and external clients. Personality – designed to measure personality traits as they apply to a workplace setting, such as decision making, cognitive learning, problem solving, and service orientation. Some popular examples of personality assessments include Myers-Briggs, Predictive Index, and Wonderlic. Case Study – widely used by management consulting companies, case studies are used to assess a candidate’s communication and presentation skills, problem solving skills, understanding of the industry, and their ability to analyze, interpret, and leverage available data. Looking for some tips on how to pass a job assessment test? Use these 4 best practices to showcase your skills and help your chances of moving to the next step in the hiring process. Preparation begins with knowing what type(s) of tests might be administered for the role. Research the types of assessment(s) and even the specific question(s) that other job seekers have experienced at the company using the interview tab on the company’s Glassdoor profile. Online forums on Indeed and LinkedIn groups may also be good resources for this type of information. Many skills tests utilize simulation software of common office applications such as MS Excel, Word and PowerPoint. While the simulation very closely mirrors the user interface and user experience of the actual application, it typically has not been programmed to understand all of the shortcuts and hotkeys. Consider the example MS Excel assessment question below. 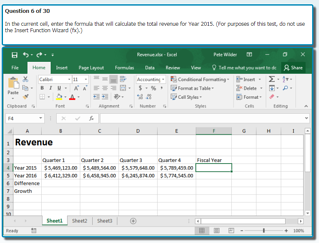 The user is instructed to enter in a formula that will calculate the total revenue for 2015. The skills assessment software wants the user to answer the question by typing “=sum(b4:e4)” into cell F4. 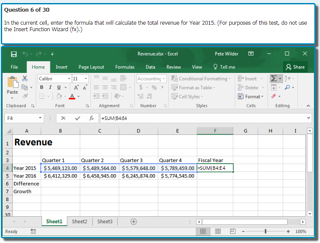 Experienced Excel users know that methods such as using the Insert Function Wizard and "CTRL+=" will also yield the same result. However, when using these methods for the assessment, the answer would be marked as incorrect. Personality tests have become more popular over the years. This is largely due to more and more research that supports the notion that if a position and an employee’s personality are not an ideal match, low engagement can often result. Employees with low engagement are found to be 21% less productive and about 45% more likely to leave the company. By answering the questions in a personality test honestly, you will increase your chances of being placed into a rewarding position that will best match your personality type and maximize your skill sets. 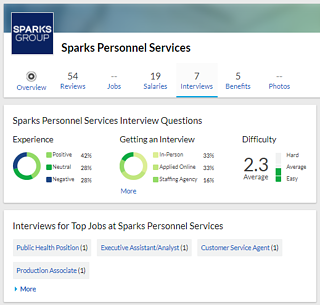 For more help on how to take a job assessment test, contact the team at Sparks Group. With over four decades of experience in hiring, we’d be happy to share our thoughts and help you excel in your career!